A new Classification field has been added to the Inventory screen. This can be used on its own as a field for searching and reporting, or in conjunction with other fields for requirements, sorting or associations. Once turned on, the Classification field will be added to the Additional tab of the inventory items, but for your specific needs, can be moved using our Layout Profile feature. You can set up your list of Classifications and the settings of each in the Item Classifications area of the Inventory - Maintain Backstage Group. This allows you to Require certain fields or preset other fields for items that are designated to that classification. 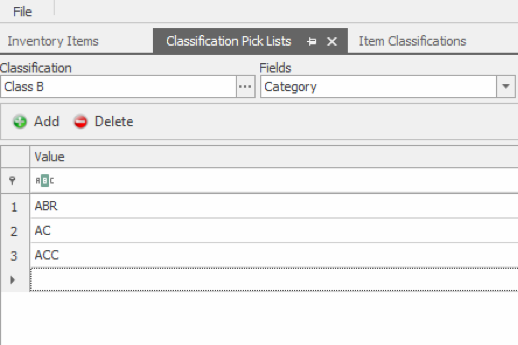 You can also use the Classification Picklist area to associate your Classifications to other lists, so the other list is dependent upon what classification is chosen first. Custom fields 1-48 can be used for the pick lists as well if we don’t have a field on the inventory screen that can accommodate the user’s needs. Another neat feature that ties into this is the “Use Item Description Custom Rule Logic” preference. The users can pick a certain set of fields along with a specified order and the program will automatically generate the item’s description.